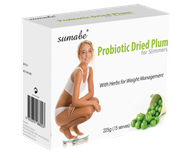 Sumabe Probiotic Dried Plum for Slimmers with herbal ingredients is a perfect companion to assist with weight management. Dried plums naturally contain antioxidants and are a source of fibre. 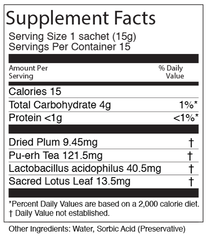 Pu-erh Tea (Aged Tea) is known for its cleansing properties and has many nutritional benefits along with the other ingredients can help with weight management plans.Made from edible herbal plants such as Pu-erh Tea and Lotus Leaf, it is prepared with specific ingredients including dried plums and active lactobacillus. Active lactobacillus can help to maintain a healthier digestive system and can help balance intestinal microflora. Adults and children ages 12 and up, consume contents of 1 sachet per day after a main meal. For best quality, store in a cool and dry place, out of direct sunlight.